Mod The Sims - 2 bridges making one bridge. 2 bridges making one bridge. Replies: 4 (Who? ), Viewed: 5162 times. I am making a world and I want a bridge in it. so far I've placed a few bridges and that works just fine but I want to create a bigger bridge by placing 2 bridges against each other. I haven't tested that out myself but you always can. In a backup copy Just conect a bit of road either side, hit the Rebuild Routing Data in the tab and export your world just to test the bridge. Yes, this is possible. I did it for a quick and dirty world I made for my daughter. You need to have the bridges aligned perfectly- the little 'handles' (the blue boxes you see when the bridge is selected) on each bridge need to be at exactly the same co-ordinates, so that the end of one bridge is exactly at the start of the next. Doing this, you can align two, three, four or more bridges. Because of the difficulty of aligning the handles, the easiest way of achieving this is to have the bridges exactly aligned to grid. This is because you can then use the axis movement to 'slide' the bridge along one axis until it aligns. If you do it the difficult way (like I did) and want all of the bridges at varying angles, you will find that you can't just slide the bridge along a single axis- you have to juggle it along two axis, which is tricky. In that case you might find it easier to work out the co-ordinates that the bridge needs to be at to match the handle co-ordinates, this can be done with some basic trig using the world co-ordinates of the bridges. Otherwise, just align the handles by eye, and it should work! 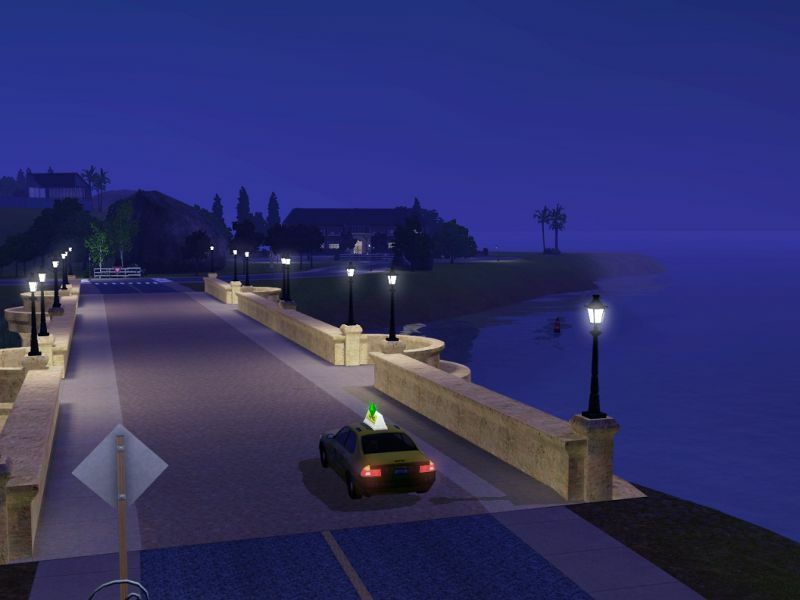 If you are slightly off, cars might 'dip' into the road as they drive across (but this is purely cosmetic and doesn't affect the functionality). 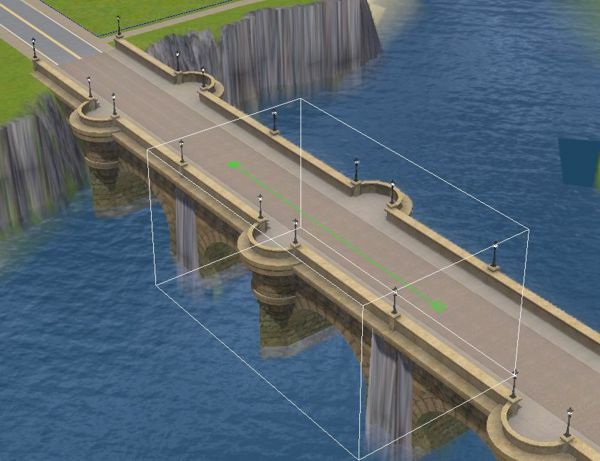 If you get it spot on, sims and cars will cross the bridges smoothly, with no deviation from the road at all. You can do this with any of the EA bridges, even the Bridgeport Suspension bridge. However, I find that the Bridge with the lantern looks funny if you connect the blue squares, since the lanterns double in the connection parts. I connected them by placing the bridges, so the lanterns lie in each other, and then put a tiny piece of road in between. You'll see a bit of land at the side of the bridge, though, but just saying it's another way to do it. I made a detailed tutorial on the sims3 forums, but in german. Thanks for that, sakasiru- that's a good idea. I tried that in a world I was making, but couldn't get the edges of the raised land to look good. Do you have any tips for disguising that?